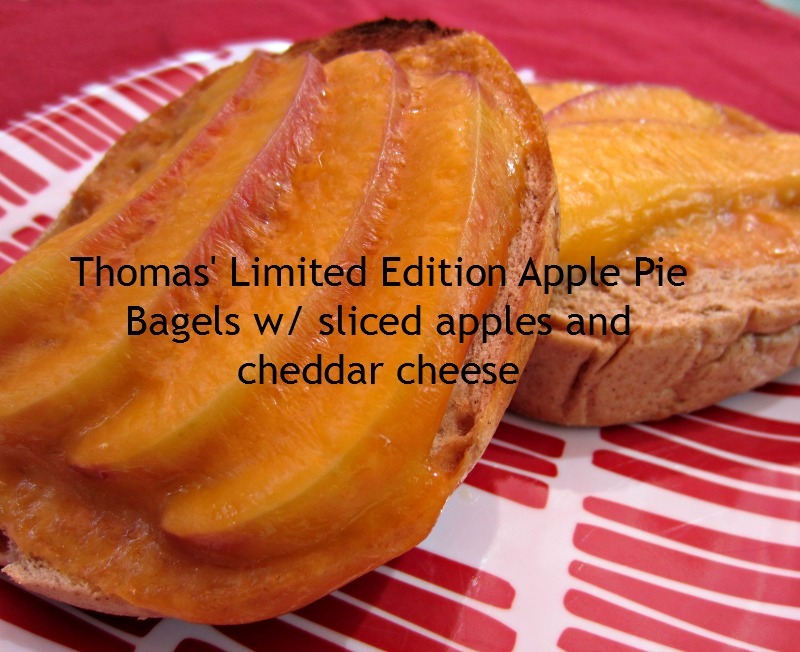 Product Review: Thomas'® Limited Edition Bagels and English Muffins: Banana Bread and Apple Pie! The newest additions to the Thomas'® Limited Edition collection?? Apple Pie Bagels and Banana Bread English Muffins have arrived! The Banana Bread English Muffins were delicious toasted with some whipped butter or a bit of peanut butter. The banana flavor is subtle and not overwhelming, yet you know it's there. They are slightly sweet on their own. Pump up the banana flavor by topping a muffin with peanut butter with some fresh banana slices! 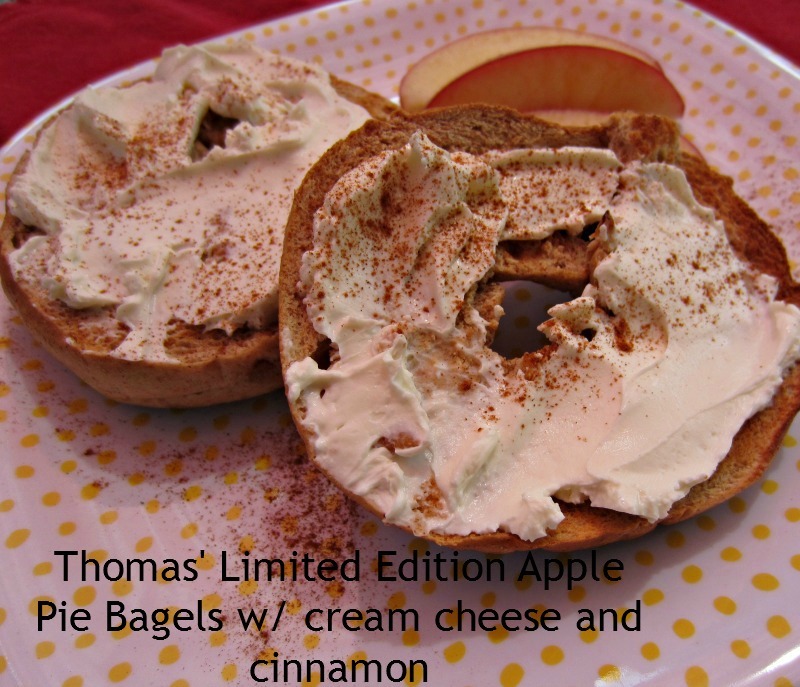 The Apple Pie Bagels were yummy with bits of real dried apple throughout the bagel. We enjoyed them in this house toasted with some light cream cheese and a sprinkle of cinnamon, as shown above. For something different, we enjoyed a them with thinly sliced apples and a slice of thin cheddar cheese melted in the broiler! Did you know Cheddar cheese and apples LOVE each other? I've heard they are thinking about getting married! Both flavors not only make a great breakfast but they are also the perfect afternoon snack! Remember they are only available for a limited time and not available in all markets, so if you see them, grab them today!! For more information on these or any of the other great Thomas'® products visit Thomas'® site HERE or LIKE them on Facebook! 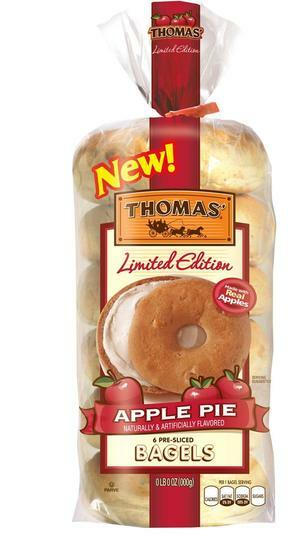 How would you top your Thomas' Apple Pie Bagel or Thomas' Banana Bread English Muffin? I haven't seen these around here yet! You are so clever with your seeing suggestions Rene. I love what you did with the apples and cheddar. They DO love each other! I can't tell you the last time I ate a bagel but these do sound delish! I think I'd go for the apple too. And I love, love the apple/cheddar combo too - I used to think my Dad was nuts when he melted a slice of cheddar on a slice of apple pie - but its so good! i had no idea they made these flavors! wow!